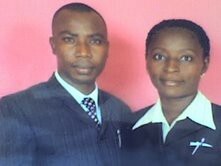 Biography: Royal Covenant International Ministry began in May 1999 in Ikom, at the border of Nigeria and Cameroon. The emphasis of the ministry is soul winning or as Williams says, "aggressive evangelism." They have planted two branch churches recently. The vision of the ministry is to reach out and restructure lives for the kingdom of God. Williams and Arit reach out to communities with the gospel of Christ with the demonstration of the power of God. They assist the needy widows and orphans in those communities with material goods and food. The church has cell groups which are in areas not accessible to the church. They meet every Sunday evening. Royal Covenant has an active children's and youth ministry. The youth operate as the outreach arm of the church. Strengths: Williams and Arit are passionate about reaching out to those in need and unsaved, delivering the oppressed and possessed. They are very proficient in English.